MEP Shark 282, CCS, SX and CNC FE band-sawing machines available from Power Machinery offer different solutions to various cutting applications. The basic 282 manual model forms the basis of the other models, each with additional features and enhancements. The CCS (Cut Control System) executes single cuts without the need of an operator, the SX is a semiautomatic electro-pneumatic model with microprocessor, while the CNC FE is fully automatic with its multi-microprocessor. Advanced features such as a main lockable disconnect switch, emergency stop, motor magneto thermal overload, minimum tension coil, and missing phase protection - all of which are clearly marked for easy identification are common to all four models. In addition, all four models have the IP55 control handle, wire brush for band cleaning, sliding vice (fast sideways positioning), wide rotating table mounted on a 265mm roller bearing (pre-wound, axial bearing), adjustable precision stops (0°, 45°, 60°, left, and 45° right), moving-equipment compatible, bimetal band (solids and sections), and the relevant service keys and instruction manual. Common to the manual and CCS versions of the Shark 282 are a hydraulic transducer (visualisation of band-tensioning), steel base with pull-out coolant tank and electric pump for band lubrication and cooling, and loading table compatible stock support arm. Controlled by a spring and hydraulic cylinder equipped with a speed regulation valve, the CCS allows the cutting in an autonomous manner with constant pressure. This CCS component can also be retrofitted to 282 machines in the field. 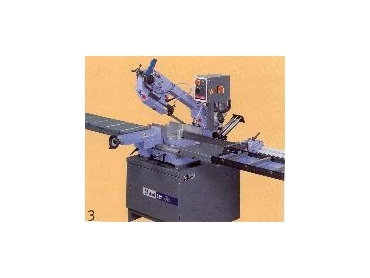 The semiautomatic electro-pneumatic version of the 282, the SX, regulates head stroke according to the dimensions of the material to be cut, which is programmed without any mechanical adjustments from the control panel. A movable start/emergency device (electro-pneumatic cylinder with axial break) and check panel with LEDs to notify machine functions further enhance the SX. The more sophisticated one of the 282 machines, the CNC FE, extends the SX model with a dual axis multi-microprocessor enabling 32 different lengths and quantities from the same bar, and four different cutting cycles: automatic, semiautomatic, semiautomatic dynamic, and manual. Semi-automatic cycle is initiated and directed from the control panel with each step in the cutting process being initiated by the relative button on the panel. Regulation of the head stroke is achieved by programming the material parameters in to the control panel. The semiautomatic dynamic cycle expands the number cutting modes, and in addition to the automatic cycle allows the making of odd cuts without the need for programming cutting parameters. Other features include a control panel with its touch-tone polyester membrane keypad, tactile thermo-shaped buttons, and 40-character/16-line display to visualise technological parameters such as: band speed and thickness, number of cuts, feed length, amperemeter, band tensioning, diagnostics and caution messages visualised in the language of use. The CNC FE is the sophisticated element of the CCS, SX combined with some more advanced features. As with CCS, the CNC FE has an electronic transducer to visualise band tensioning, while like the SX the head stroke is regulated by the dimensions of the material to be cut and programmed without any mechanical adjustments from the control panel. Some of the CCS FE advanced features include: motorised feeder with 500mm single stroke feed-length, feeder carriage with sideways movement for deformed bars, flashing acoustic indicator in case of cycle stoppage, adjustable pressure regulator for head and vice, automatic adaptive shearing stress control system (with servo-valve mounted directly on the cylinder), electro-pneumatic cylinder with axial brake, and band rotation control for immediate blade stopping in case of jamming. Each successive model extends the functional capacity of the last in both automation and task specificity. Procedural steps that have in the past required the action of an operator can be individually initiated fully programmed for automatic execution depending on the model and the task requirements, and components can generally be retrofitted if needed.